The city embraces its first craft brewery – in a former mill building. 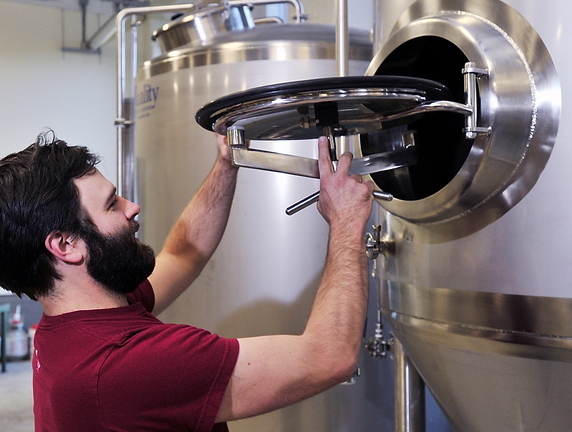 BIDDEFORD — When Ian McConnell walked into a former textile mill on the banks of the Saco River, he knew he’d found the perfect place to brew beer. “It was an obvious choice for us,” McConnell said as he stood in the former Pepperell dye house, a row of shiny stainless steel brewing tanks waiting at the ready behind him. There are tall ceilings, wide open spaces and the abundance of character that come with a 200-year-old building. McConnell also found in Biddeford a community ready to embrace its first craft brewery. McConnell’s Banded Horn Brewing Co. will begin brewing beer as early as this week, less than a decade after he and his cousin Ron Graves discovered their love for home brewing. “It was a hobby that quickly grew into an obsession,” McConnell, 33, said. Banded Horn will join a growing community of craft brewers across the state. There are 47 craft breweries currently operating in Maine, up from 32 at the beginning of the year. Another 15 are on their way to opening, said Sean Sullivan, executive director of the Maine Brewers’ Guild. The quick growth of craft breweries in Maine mirrors a national trend. There were just eight craft breweries in 1980 and 537 in 1994, but more than 2,300 by 2012, according to the national Brewers Association. The association says the majority of Americans now live within 10 miles of a brewery. 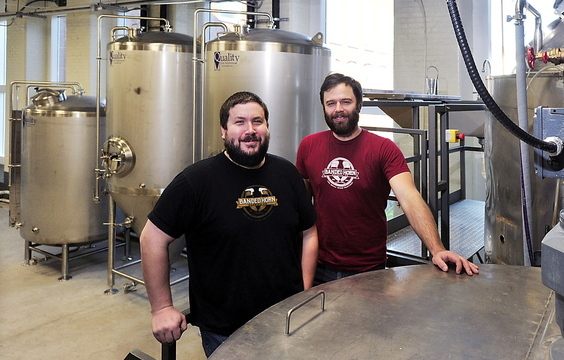 McConnell and Graves, who grew up in central Maine, jumped into home brewing in 2005. They were on a road trip when Graves said he wanted to try brewing his own beer – something McConnell hadn’t thought about before. They stopped at a supply shop and grabbed supplies to brew their first beer, an IPA. “It seemed like we were brewing every day,” McConnell said. McConnell moved to Brooklyn, N.Y., a year later and started hanging around Sixpoint Brewery. In 2007 he landed an internship and, two years later, was Sixpoint’s brewmaster. Graves, meanwhile, was back in Maine, working in shipping and receiving and brewing beer at home. “I never had dreams of becoming a professional brewer,” Graves, 33, said. But then his cousin called to tell him he was moving home to Maine and had plans to start his own brewery. Graves quit his job and now runs the brewery’s operations. As at Sixpoint, McConnell is the brewmaster. After finding the mill space and lining up $400,000 in private investment, loans and personal savings, McConnell set out to navigate the long – and sometimes arduous – road to opening a brewery. They’ve had to deal with local, state and federal regulations, but expect to get the final OK to start brewing this week. Banded Horn will begin with three beers: a pilsner named Pepperell Pils as a tribute to the former textile mills; an IPA called Veridian that will be their first brew; and a stout, which has not yet been named. They plan to branch out with other varieties and have the space to add more brewing equipment as they grow the business. The cousins have raised more than $21,000 through a campaign on the crowd-funding website Kickstarter to build a tasting room, which they hope to have ready by the beginning of the year. It will feature a bar made of southern yellow pine timbers harvested in the late 1800s and used in the mills. McConnell, who was hesitant about launching the Kickstarter campaign, said he is still amazed by the support of not only other craft brewers, but also the Biddeford community.